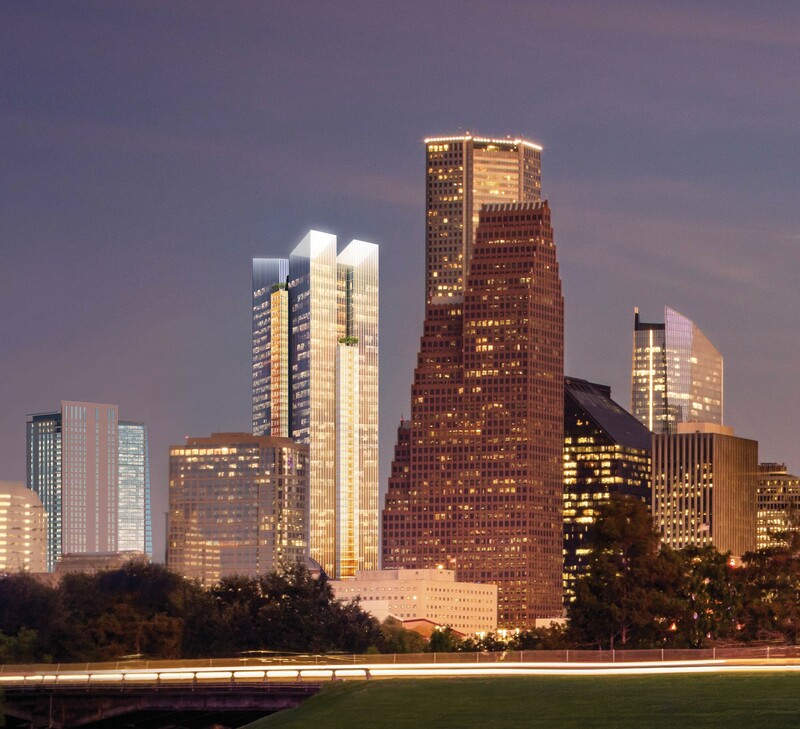 Hines’ next addition to the Houston skyline, shown in this evening rendering image just to the left of the Bank of America Center, was designed by Pelli Clarke Pelli Architects. The building will be constructed on Texas Avenue at Travis Street on the former site of the Houston Chronicle building. The 47 story-tower will feature about 36 levels of office space sitting atop a podium of parking and street-level restaurant, retail and lobby space. Hines developed most of the towers in this rendering showing the northern portion of downtown Houston. Design: Pelli Clarke Pelli Architects. HOUSTON – (Realty News Report) Hines has announced plans to start development on downtown Houston’s next skyscraper – a 1 million-SF tower built on the former site of the Houston Chronicle building, which has been demolished. Hines, a real estate development firm founded in Houston in 1957, will move its own headquarters into the new 47-story building, leaving the Williams Tower next to the Galleria to occupy 155,000 SF in the new building. The Vinson & Elkins law firm, represented by Cushman & Wakefield will occupy 212,000 SF. Michael Anderson of Colvill Office Properties is leasing the new building for the ownership. The downtown Hines site, known as Block 58, is bounded by Texas Avenue, Travis, Milam and Prairie. Hines is developing the building in partnership with Ivanhoe Cambridge, a Canadian firm. The Block 58 building will have the outdoor gardens and terraces that made Hines’ new 609 Main at Texas building so appealing to tenants. Even though the downtown Houston office market has been sluggish, new buildings have been successful in attracting tenants because of their appealing design and modern accoutrements that help tenant firms with recruiting and retention of employees. Rendering of new tower shows Hines’ 717 Texas Avenue building (left), new Hines building (center) and Hines’ Chase Tower on right. Pelli Clarke Pelli Architects designed the Block 58 building for Hines. Pelli and Hines recently teamed up to build the new 61-story Salesforce Tower, the tallest office building in San Francisco. A Hines group bought the Block 58 site – with an additional half-block used as the Chronicle garage – in October 2015 for about $54 million from Hearst Newspapers. The newspaper left downtown and moved to Southwest Freeway at Loop 610, a building that formerly housed the Houston Post. Hines demolished the downtown Chronicle building and the site is now a surface parking lot. Hines developed a number of properties around the Block 58 site, including the 75-story Chase Tower across the street, which is the tallest building in Texas. A couple of blocks away, Hines recently completed two additional nearby towers, the 609 Main at Texas and the Aris Market Square residential high-rise. And there are a number of other Hines downtown skyscrapers within walking distance. People in the real estate community say there has been some urgency to move ahead starting construction on the building and have it ready for occupancy in 2021. Vinson & Elkins’ current lease in the 1001 Fannin building, formerly known as First City Tower, expires in 2021 and construction work needs to start soon to meet the law firm’s deadline. Vinson & Elkins was represented by Tim Relyea, Scott Wegmann, Kevin Snodgrass, Jim Bailey and Brooke Wommack with Cushman & Wakefield. Hines began to define the Houston skyline with One Shell Plaza in 1971. Almost a half-century later, this latest development is Hines’ 12th ground-up office tower and 29th development project in downtown Houston.